The Cassville Wildcats overcame an error-filled stretch to claim a 39-28 victory on the turf at Reeds Spring on Friday night. The Wolves took advantage of turnovers and miscues to take a 15-14 halftime lead. But the Wildcats stormed to touchdowns on their first two possessions of the second half to go in front, 27-15, and never relinquished the lead. Shannon Haney ran wild against the Reeds Spring defense, scoring four rushing touchdowns while gaining 190 yards on 24 carries. The teams entered the stadium with identical 0-1 records. Reeds Spring dropped a 35-20 decision to Mt. Vernon in week one, while Cassville absorbed the 28-0 shutout at the hands of Lamar. One very good football team would end the night 0-2. The Wildcats struck early, holding Reeds to a three-and-out, then covering 71 yards in just five plays. Shannon Haney connected with Anthony Tolbert on a drag route over the middle for a 53-yard gain on the first Cassville offensive play. On second and 17 from the 25, Haney battled off left tackle to the 5-yard line. Tolbert bounced outside to score on the next play, and a Drake Reese PAT gave Cassville a 7-0 lead with 8:47 on the first quarter clock. The Wolves fumbled the ball back to Cassville on the first snap following the kickoff. Sophomore quarterback Blake Gronvold flipped a pitch behind his running back, and Johnny Medina pounced on the ball at the 26-yard line. The Wildcats could smell a second touchdown as Haney dropped into the pocket for a second down pass attempt. But Seth Stamps made a saving interception and returned the theft to the Reeds 34-yard line. The Wolves embarked on an 11-play scoring drive, aided by three Wildcat penalties. Kelly Newton plowed into the endzone to finish the drive. Blake Nordin’s kick was wide though, and Cassville led 7-6 with 3:48 left in the opening quarter. A punting duel ensued, with the host Wolves taking control of field position when Cole Nordin downed a Kyle Modlin effort inside the Cassville one-yard line. That led to Stamps fair catching a Haney rugby kick at the Cassville 35-yard line to start the second quarter. The Wildcat defense came up big again. Logan Carlin recovered a fumbled snap at the Cassville 26-yard line. Haney started the drive with a 5-yard keeper, then Tolbert creased the Reeds defense with back-to-back 18 and 14 yard runs to give the ‘Cats a first down at the Reeds Spring 37-yard line. Reese drilled another PAT to give the Wildcats a 14-6 lead with 9:46 left in the half. The Wildcats appeared to have momentum back in a white jersey when the defense held the Wolves to a three-down possession. But another booming punt pinned Cassville deep, and then Cole Watson intercepted Haney to set up the Wolves with a first and ten at the Cassville 12-yard line. The Wildcat defense met the challenge, holding Reeds out of the endzone when Newton slipped to his knees on fourth down. But the Wolves held Cassville to a single first down on the next possession, and then Newton, the all-state sprinter, broke a 73-yard touchdown run to pull Reeds within 14-12 with 2:34 on the clock. The two-point conversion try failed. Reeds Spring continued the special teams dominance, pinning Cassville at the 14-yard line on the kickoff. Haney punted away after three plays, and the Wolves took over at their onw 46-yard line with less than a minute remaining. Gronvold led a masterful drive, managing the dwindling clock while leading his team to the red zone. A 35-yard bomb to Modlin put the ball at the Cassville 5-yard line, and Gronvold spiked the ball to kill the clock with five seconds left. Blake Nordin split the sticks with a 22-yard field goal as time expired, and the Wolves stunned the Wildcats with a 15-14 halftime lead. It was an ugly quarter for the visitors, and the Cassville coaches challenged their players at halftime. The Wildcats responded with touchdown drives on their first two possessions of the second half. Haney’s 48-yard TD run led to a 21-15 Cassville lead. The junior quarterback scored again on a sneak from the wishbone formation for a 27-15 advantage with 5:04 on the third quarter clock. But the Wolves would not fold. Newton burst off left tackle for a 60-yard scoring sprint with 9:50 left in the final quarter to cut the lead to 27-21. Reeds went for two on the conversion, hoping to cut the lead to just a field goal’s worth, but Cole Nordin was tackled short of the goal line. The Wildcats’ lead was down to 27-21. Shannon Haney limped off the field on the following Cassville possession, wracked with leg cramps. Deven Bates came on to lead the ‘Cats on a 10-play, 80-yard scoring drive. Tolbert blasted through the line on third-and-goal for a 17-yard scoring run. Cassville led 33-21 with just 5:16 left to play. The Wolves came out throwing after the kickoff. Darrell Royal, the hallowed Texas Longhorn coach, adopted the triple-option wishbone attack based largely on his disdain for the passing game. “There’s three things that can happen when you throw the ball, and two of them are bad,” Royal said. Reeds Spring illustrated Royal’s philosophy perfectly on this possession. Gronvold threw incomplete on first down, and was then intercepted by Medina - the unanimous defensive player of the game - on the next play. Haney returned to the fray, and scored on a 23-yard gallop to give Cassville a 39-21 cushion with 4:10 remaining. 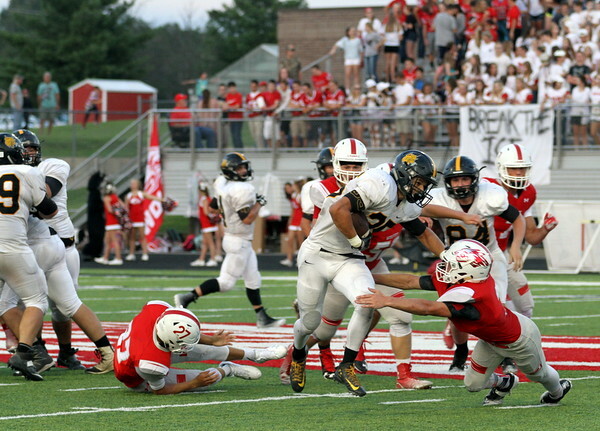 Gronvold kept the Wolves alive with a dazzling 53-yard scoring scramble that trimmed the Cassville lead to 39-28. But the Wildcats ran the remaining 3:32 off the clock with a ball-control drive. Bates took a knee from the victory formation at the Reeds 11-yard line as time ran out. While Haney led all rushers, Newton led Reeds Spring with 171 yards and three scores on just 12 carries. Cassville’s Tolbert also cracked the century mark, posting 117 yards on 134 carries. Haney finished with an odd stat night, throwing three interceptions. The Wildcats improved to 1-1 with the victory and will play at Granby against East Newton on Friday night. The Patriots have lost their first two games to Lighthouse Christian and Lamar by a combined score of 103-0. Kickoff is set for 7 p.m.